It's easy to imagine that you're relaxing on the bayou with this quick-cooking, flavorful seafood dish. 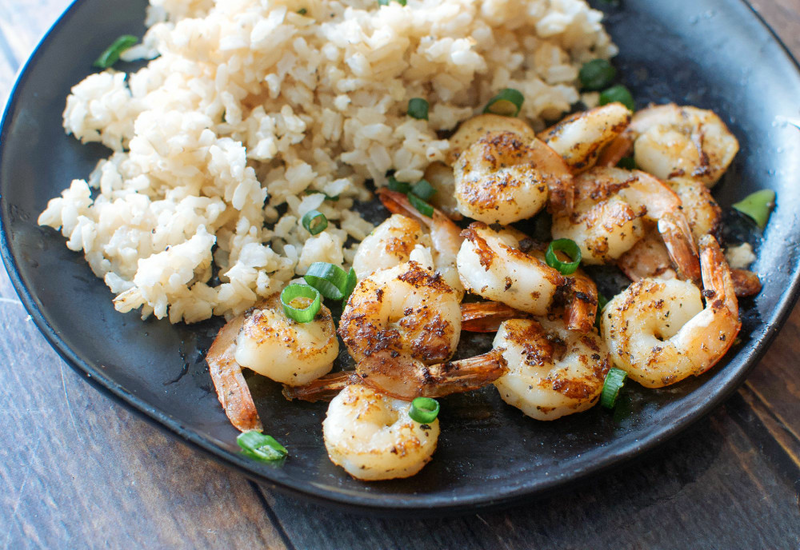 Thanks to a DIY spice rub with Cajun flavors like cumin, paprika and garlic, there's no need to marinate the shrimp ahead of time. Lemon juice and chopped green onions add a little brightness and tang. The dish is naturally gluten-free and low in calories, so it's also a great option for a healthy yet flavorful weeknight dinner. To make these spicy shrimp into a full meal, serve with homemade dirty rice, red beans or grits—just don't forget the Tabasco! If you're not looking to purchase multiple spices, save time and money by picking up a pre-made Cajun spice rub. Substitute 1 tablespoon spice rub for the cumin, paprika, oregano, salt and pepper, and toss the shrimp in a mixture of spice rub, garlic, olive oil and lemon juice as directed. Per Serving: 207 calories; 9g fat; 4.5g carbohydrates; 26g protein; 239mg cholesterol; 1152mg sodium. The Cajun seasoning mixture in this recipe was perfect for the shrimp. Instead of using rice, we tossed the shrimp in pasta with butter. Very delicious and spicy! Being from the south, Cajun shrimp is a staple. We live in the gulf so we bought huge shrimp, and generously seasoned it with all of the spices in this recipe. Not only is it quick, but the cleanup is easy and the flavors are mouthwatering. If you like spicy seafood, this is a must try. I used really large shrimp that I picked up from the seafood market. This was really dish, amazing flavor. Baking shrimp on a sheet is a lot simpler than using my cast iron because I can throw on other veggies too, like broccoli or asparagus. Served this Cajun-y shrimp with asparagus. I also used really large shrimp (8-12/lb). The Cajun spice rub I used was store bought, super delicious and easy. Would not have thought to make this otherwise. This spice mix was good, but could have used cayenne pepper. I like that it's not as salty as the store bought kind. I used gulf shrimp and served it with catfish.